High-achieving students from non-traditional backgrounds are far less likely to apply to top universities than their more affluent peers – even when they receive the same results in their exams. In the UK, half of students with AAB in their A-levels do not attend a Russell Group university. The likelihood that a student who qualifies for free school meals makes it to Oxford or Cambridge is 1 in 1,500. For the privately educated, it is 1 in 20. A UK government report found there is a state school ‘penalty’ in the admissions process equivalent to one A-level grade. 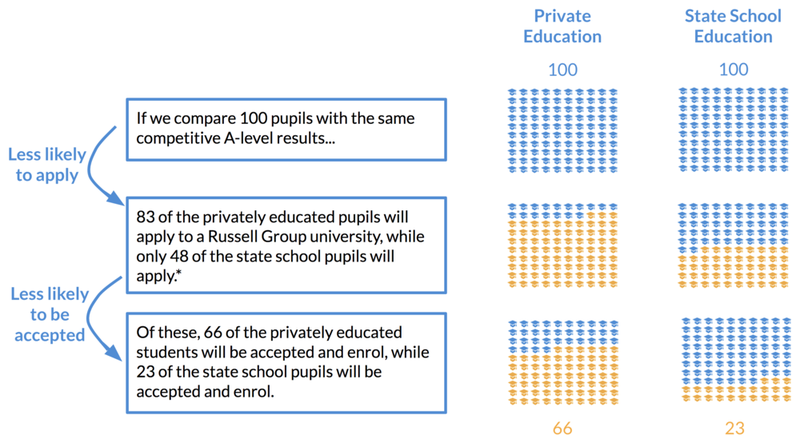 This means a state school student who applies to a Russell Group university would need to achieve one grade higher in their A-levels to have the same chances of being admitted to a Russell Group university as an otherwise identical privately educated student. Students in private schools often receive a high level of support and encouragement during the university application process, which typically isn't available to students from low-income backgrounds. At Russell Group Universities in the U.K., students from low-income communities were 50% more likely to drop out than their peers from high-income backgrounds. That's what Project Access is here to change!